We might “play” with concrete and glass but, above all, Graph Building is a people business. With most of the physical building activity undertaken by subcontractors, Graph employs a dedicated staff of about 25 people, all committed to providing quality outcomes and comprehensive customer service to clients. Graph’s people know what they’re doing and execute it well and in an exemplary fashion. There is a great blend of youth and experience in the people at Graph, with the “longer experienced” delighted to see outstanding young people coming through the ranks in both office and site-based positions: young people who are bright and committed, and who fit the company’s ethos of providing genuine service to clients. Below is some background information on key members of our staff that you will deal with during your project. BE (Hon), University of NSW (Civil, 1974). Fellow, Institution of Engineers Australia. Board member and Past President, Newcastle Master Builders Association. Ross started his career with NSW Public Works in 1974 and worked on a range of public infrastructure projects, including the Carrington Grain Terminal upgrade that brought him to Newcastle in 1985, and the construction of the initial stage of the John Hunter Hospital. He moved into private employment in 1988, when he joined the McCloy Group as a Project Manager and where he subsequently held the position of General Manager from 1993 to 2007. Ross has been the General Manager of Graph since it began in 1999 (holding that position in both organisations until resigning from the McCloy Group in 2007). Extensive experience in property development is part of Ross’s make-up, and he’s always available and willing to provide relevant advice to clients. John was born and bred in Newcastle and began working in the construction industry in 1983 as a first-year apprentice Carpenter/Joiner with Belmont based D F McCloy Pty Ltd. John completed his trade course and his Clerk of Works Certificate over the next six years. John’s leadership and management ability were recognised very early in his career when, as a fourth-year apprentice, he was appointed to the position of Site Manager. His early experience in that role was predominately in the construction of medium density housing, which is an ideal form of construction to learn and hone one’s skills in sequencing and quality control. Over the fifteen years that John spent in the role of Site Manager, his experience extended into a wide range of projects, including schools, aged care facilities, commercial projects, hospitality and club projects. When McCloys sold the building business in 1999, John came across to Graph. In 2002, he was appointed to a Project Manager position in Graph Building, in which role he managed a similar range of projects. 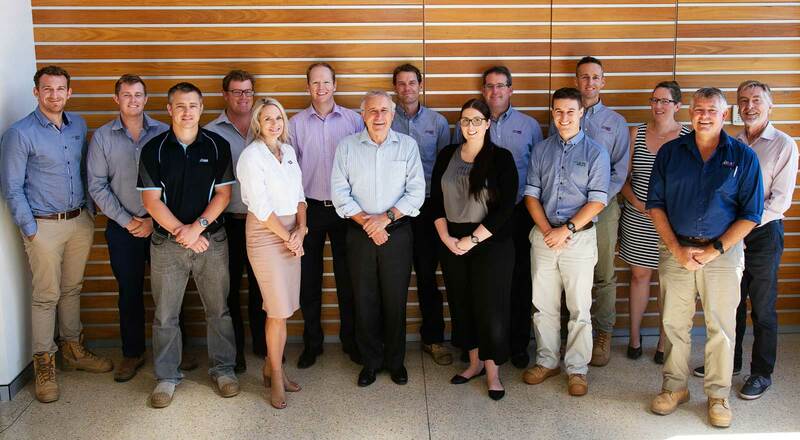 Many of them are landmark projects within Newcastle and the Hunter Region, which have won prestigious MBA Awards for Excellence in Construction. However, most of John’s experience as a Project Manager has been in clubs and hotels, where he has delivered an impressive list of projects to a number of clients but, in particular, Wests Group Australia. Many of his projects have been refurbishments, carried out in facilities which have continued to operate throughout the course of the work. Although John has been in a management role for many years, it remains that his trade background, coupled with his attention to detail, has equipped him to provide practical and cost-effective solutions to issues which inevitably arise in the course of renovation and refurbishment projects. In 2017, John took on the role of Construction Manager at Graph, which allows his skills and expertise to benefit Graph’s projects generally. David Slee has an extremely important role with Graph, having been selected early in 2009 to fill the new position of Systems Manager. It is a role to which he is passionately committed. David was selected on the basis of his experience with national companies on large projects, particularly with OH&S (as it was then known), QA and environmental management systems. In particular, David has a strong commitment to delivering safe and healthy workplaces. He also appreciates the significance of Graph’s reputation of consistently delivering quality outcomes to clients. As Systems Manager with Graph, David is the management representative for all WHS, quality and environmental issues. He is responsible for the continual improvement in our integrated management system, and for its ongoing certification as complying with AS/NZS ISO 9001, AS/NZS 4801 and AS/NZS ISO 14001. He has submitted the WHS components of our system and achieved accreditation with the Federal Safety Commissioner. Whilst David is primarily focused on providing a compliant system which achieves superior outcomes, he does so within the framework of having a system which is practical and user-friendly. Graph has been recognised as a builder who has “really embraced the standards, has a record of conformance, and shows clear management commitment”. Tim Crossingham commenced work with Graph in June 2007, when he was still an undergraduate. His undergraduate studies were initially undertaken on a full-time basis but the final year was completed part-time so that he could obtain industry experience with Graph. Prior to his graduation, Tim assisted in the contracts administration role of the Coal Services/Mines Rescue facilities upgrade ($20m) in Newcastle, Singleton and Lithgow. In 2008, Tim moved into the role of Assistant Project Manager for the construction of a major development, the Caves Beachside Hotel, working closely with Graph Management, consultants and subcontractors and maintaining strong client relationships. Following the success of the hotel’s construction, Tim was able to progress his role within the company and within the Caves Beachside development, taking on the role as Project Manager for the Civil Works, Beach Suites Fitout and the Village Display House. Tim had a busy time during 2010 and early 2011 as Project Manager on four stimulus package projects – two BER public schools, and two medium density housing projects. These were the first projects that Tim delivered to the public sector, and all four were completed to high-quality standards and to the satisfaction of the clients involved. Over the past seven years, Tim has managed the construction of several apartment buildings, along with a wide diversity of commercial building projects covering education, health and retail sectors, aged care, as well as commercial office developments. He has also worked for a diversity of clients, with the larger ones being Suncorp, GPT Group (Charlestown Square projects) and Aveo. James Hickey is a relative newcomer at Graph, having joined the company at the start of 2016 when he relocated from Canberra to Newcastle. He came with over twenty years’ experience in the building industry and Graph was not alone in offering him employment: fortunately, he chose Graph, and it has been a good association. James has a comprehensive knowledge of the industry and is well able to manage, coordinate and supervise all trades involved in the construction process. In addition, he is widely experienced in the pre-construction stage of projects and is able to engage and manage consultants from the initial concept stage, through the approvals process, to the completion of design and certification of construction. Prior to joining Graph, James had extensive experience in a diversity of commercial and residential building projects and had even constructed a Buddhist temple (Hu Guo Bao En Buddhist Temple, ACT, $4m). His commercial projects have included health, retail, educational and office buildings, and residential projects have included apartment buildings, aged care and medium density housing. Project values have been typically in the range $2m to $30m. The ability to think laterally when problem-solving is one of James’ key strengths. Most of the projects he has managed for Graph to date were for public sector clients, and they include three projects for the University of Newcastle. David Howard commenced his working life with Westfield Design and Construction and, following the completion of the upgrading of the Tuggerah Regional Shopping Centre, he moved to work with the Linx Group on the central coast of NSW. He then worked with Graph for two years prior to moving to the USA in 2009. During his time overseas he was employed by Kettering Health Network (KHN), a private healthcare provider based in Dayton, Ohio. At KHN, David was responsible for the delivery of a wide range of projects across many of KHN’s eight hospitals, and its several health centres. At the time of his resignation, to return home to Newcastle, he held the position of Director of Construction Management, controlling all KHN’s projects from concept to final design, through the construction process, to completion, commissioning and operation. linear accelerator vault at Kettering Medical Center. He has experienced a wide spectrum of healthcare projects, many of which were delivered within the challenging setting of a fully functioning hospital. David brings to any project his sound knowledge of the building process, and extensive experience in the management of design and construction projects, particularly those associated with health care. His time in the USA also increased his commitment to customer-focused delivery. His primary role at Graph today is running Graph Residential but, as and when it’s appropriate to do so, he also fills the project manager role on commercial projects. Dean Lawrence commenced employment with Graph early in 2010, when he took up the position of Estimator. At the time, it was a new position, established to expand our estimating capability under the watchful eye of the widely experienced, and well respected, Company Estimator. The expansion was not only directed at winning more work, but it also reflected the growing complexity of the estimating process, where an ever-increasing level of documentation needs to be addressed during a tender period. Prior to joining Graph, Dean had worked with another local builder as a Project Manager, where he obtained a good grounding in the local building industry. In particular, he developed an excellent appreciation of the structure of the building industry, where subcontractors undertake the physical work, making good relationships with good subcontractors a fundamental requirement for a successful building business. Dean readily adapted to the role of Estimator, and to Graph’s approach of carefully evaluating all trade quotes received, and not just selecting the lowest for each trade and “adding them up”. With the conflicting objectives of being both competitive and profitable, the Estimator’s role is a highly responsible one. Dean has been very successful in winning projects by competitive tender but, when clients have appreciated the benefits of a higher level of involvement from Graph, Dean has also provided budgets from concept/feasibility stage through to DA/CC, then to final tender. Of recent times, Dean has been appointed to the position of Company Estimator in recognition of his outstanding skills and abilities as an estimator. Anthony Williams is a newcomer at Graph and brings with him a broad experience which extends across the land and property development lifecycle. In April 2018, he filled the new role of Development Manager, which was established in response to increasing requests from clients for Graph to assist in the pre-construction phase of building projects. With the role having an initial emphasis on large scale residential development, Anthony was seen as the ideal fit, and was recruited to the position, but also in the knowledge that he could equally turn his hand to a wide diversity of proposals in terms of both the size and type of development. Anthony has particular expertise in statutory and strategic land use planning, and he couples this with a sound understanding and solid experience in site acquisition, due diligence and project feasibility assessment. He also has a strong track record in delivering major project approvals. He thrives when leading and working as part of multidisciplinary teams to identify constraints and opportunities, and navigate through any potential road blocks, whether environmental, political or financial, to deliver optimal development outcomes. Anthony has strong working relationships with key stakeholders across local and state government within the Hunter Region, and beyond. He is a very valuable addition to the Graph team, and greatly extends the level of service that we can deliver to clients in the design and approval phase of land and property development projects.